Grand Avenue Produce Company is a family owned company, with the second and third generations involved with the day-to-day running of the company. Grand Avenue Produce is a progressive, team-oriented company with its roots deeply planted in tradition. Grand Avenue Produce began as an open air fruit market in 1946 by Mr. and Mrs. Roy M. New. Today, after over 60 years in business, we have grown into a successful full line produce distributor. 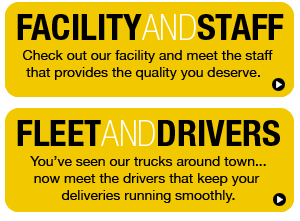 We now run 23 trucks, have over 100 employees, are open 24 hours a day, and deliver to over 500 restaurants and food service establishments statewide. to our customers, we repack each tomato that comes through our warehouse to ensure we are sending only the best quality to our customers. This repacking program allows us to guarantee our customers 100% usage of our tomatoes. in ensuring we keep our customers happy. We also provide access to online ordering and reporting to all of our customers, to help ensure accurate deliveries. Grand Avenue Produce represents a growing number of growers and shippers in all major growing areas. The relationships we have with some of these growers extend over 30 years. We also check availability and market prices on all of our commodities daily, and we have the proper resources and tools to stay on top of the market. All this comprises a full network of fresh produce on a year-round basis, and allows us to be consistent in carrying the produce that is so important to our customers, even in a tight market. Grand Avenue Produce goes the extra mile for our customers to ensure the highest level of maintenance, cleanliness, and safety in our facilities. We undergo yearly third-party inspections, and have been ASI certified, with an excellent rating and scores above 95%, since January of 2003. We at Grand Avenue Produce are willing to commit to you, the prospective customer, by doing everything that we can in growing your produce business. No other company will give you the quality, value, flexibility, purchasing strength, and commitment to service like Grand Avenue Produce. Thank you for your time and consideration, we look forward to an opportunity to show you what Grand Avenue Produce Company can do for you.